Sprint's Boost Mobile prepaid brand unveiled a new dealer-only promotion this week. 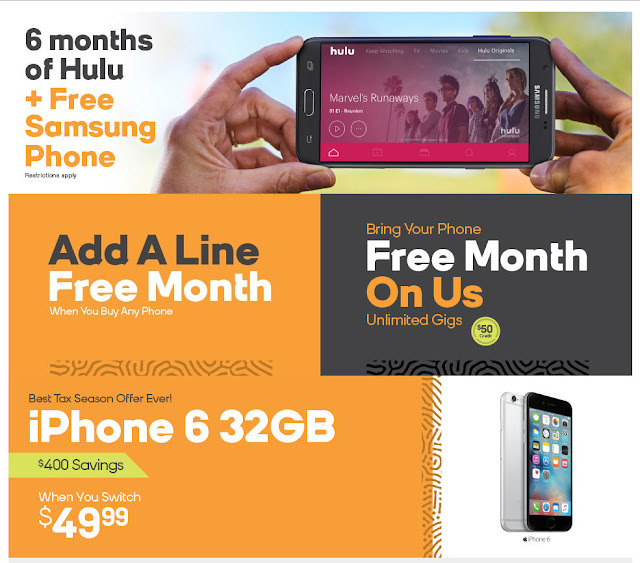 Today through April 16, new customers who port a number to Boost and activate it on Boost's $50 or $60 plan at a Boost dealer in unspecified "selected markets" will get a free Samsung Galaxy J7 Perx and six months of Hulu's Limited Commercials plan for free. The free Hulu benefit doesn't start immediately, customers will receive a coupon for six months of Hulu 10 days after their second monthly payment to Boost. Hulu's "Limited Commercials" plan, which reportedly has as many commercials as broadcast TV, normally costs $7.99/month. It includes unlimited streaming access to Hulu's collection of television series, original content and some movies. Hulu can be accessed from your Boost phone, a PC, smart TV or set top box. Boost's $50 and $60 plans both include"unlimited" data, subject to de-prioritization after 23 GB. But if you are using your Boost phone's hotspot to stream Hulu to a PC or TV, keep in mind that you are limited to 8 GB of hotspot on the $50 plan and 20 GB on the $60 plan, Video, including Hulu, is restricted to SD quality on the $50 plan. The $60 plan allows HD streaming. Boost also extended several other promos that were due to expire either yesterday or April 5. The 4 Lines of $50 Unlimited Gigs Plan for $100 promotion was scheduled to end yesterday It's been extended until April 16. All lines must be new activations and at least one must be a port-in. Five lines are $125. Todo Mexico, which includes unlimited Mexican roaming, unlimited calls to Mexico and Canada and unlimited international text messaging, can be added all lines for $10 total. This promo is available online as well as at dealers. Add a Line, First Month Free - add a new Unlimited Gigs line of service to an existing individual or family plan and get the first month of service for free. Originally due to expire April 5, this promo has been extended until April 16. Available only at participating dealers. Bring Your Own Phone, Free Month on Us - Only specific non-Sprint iPhone and Android models are eligible. Former Sprint devices not eligible. Activation of a new line of service on the $50 Unlimited Gigs plan required. Was due to expire April 5, extended until April 16. Available online as well as at dealers. iPhone 6 32 GB for $49.99 - Requires a port-in from a non-Sprint related carrier and activation on the $50 or $60 plan. Due to expire yesterday, extended until April 16. Available only at Boost dealers in unspecified select markets, while supplies last. For the offers that are dealer-only I advise calling local dealers before wasting time visiting a store. Although these offers are posted on the Boost public website (1), (2); dealers are independent businesses and make their own rules. Not all honor promotions, most charge activation fees and some have been reported to require the purchase of accessories or phone insurance to get promotional deals. In addition, the Hulu and iPhone 6 deals are limited to specific markets, which Boost doesn't disclose publicly. To avoid disappointment, call first and ask the dealer if the deal you are interested in is available and if their are any additional costs or purchases required. In regards to Hulu commercials, in my experience they last an average of 75-90 seconds. Much shorter than linear tv's 2.5 - 3 minutes. Also, Sprint works well in my area. I respect Boost for supporting their dealers but I hate the fact Boost's best promotions are restricted to independent dealers. Boost dealers in my area are very poor. They rarely participate in Boost promotions. Will boost you pay 1 we pay one cone back ?? Are any of these promos available in Bridgeport CT? Wow iPhone 6 for $49.99 is a great deal. But I wonder if there is plenty of inventory available in most stores. Usually deals like these are out of stock. Your Boost Mobile profile needs updating as it references several expiration dates from last year. I went there looking to see if fees & taxes are included in the prices (a la MetroPCS), but no mention of fees was made in the profile. Anyone tried or knows if this Boost iphone can be used on Tello without unlocking? Boost phones can't be activated on Sprint MVNOs like Tello until they have been used on Boost for 12 months. you must unlock boost phones to use on any other network. I am a dealer with a few stores, I understand that in the past dealers would refuse promo's but we can no longer do this, It is against corporate policy and now we have sprint employees who visit stores weekly to make sure we are complying with all deals that are active right now, Including having correct price tags on phones and correct promo posters on walls. Customers can be confident now that they will get promos that are active, Have a good day. I am happy to hear from a Boost dealer. Unfortunately, Boost dealers in my area are not offering either the Iphone 6 for $49 nor the Samsung J7 Perx for free with port in.